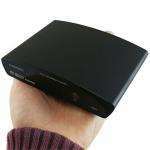 The Sumvision Cyclone Live Media Player Adaptor provides internet TV and Radio. The Sumvision Cyclone Live Media Player full supports all high definition media files. - Player which provides internet TV and Radio. English, German, Spanish, Italian, French, Portuguese, Dutch. I hope Big Pockets are reputable cos Sumvision Guarantees are worthless!!! Does this allow files to be copied from the PC to the unit using samba. ie the copy is initiated from the PC and not the player.